The Traditional Irish Horse (TIH) is part of Ireland's rich heritage and culture. Over the centuries Irish horsemanship skills have fuelled the sporting excellence of an Irish national treasure; the famous Traditional Irish Horse. The horse which walked with our Celtic predecessors and has been part of our civilisation for over 2000 years evolved to become a world leader in showjumping and eventing. The Traditional Irish Horses’ journey, evolution and influence on sporting bloodlines echo through time. 2000 years of breeding lives on through the modern Traditional Irish Horse and its contribution to world equestrianism is ongoing. We hope when you think about buying your next horse it will be a Traditional Irish Horse, so you may get to enjoy a wonderful sporting equine partner for competition or pleasure and bring a little bit of history home with you. The Traditional Irish Horse has a broad appeal for several disciplines such as show jumping, hunting, eventing, dressage and for leisure use. The versatility of the TIH, along with excellent temperament, bravery, stamina, soundness and athleticism at elite and amateur levels offers buyers of the Traditional Irish Horse an exceptional equine partner for performance or pleasure. Below is a selection of routes for purchasing and sourcing the Traditional Irish Horse. Browse the current listings of Traditional Irish Horses on line through the Irish Horse Gateway an initiative of Horse Sport Ireland. All Traditional Irish horses advertised for sale on the Irish Horse Gateway will be stud book registered with recorded pedigree. If you need assistance with purchasing a number of Traditionally bred horses the Irish Horse Gateway offers a facilitated private purchase service. In Ireland weekly and monthly sales are held of horses and ponies. Buyers can view a wide range and quality of horses at these sales on any one occasion. Should you wish to visit a sale to purchase a TIH you will need to look through the catalogues to identify which horses are actually Traditionally bred - look for the TIH or Traditional. The summertime in Ireland is alive with county agricultural shows. These local shows are full of quality Traditional Irish Horses. 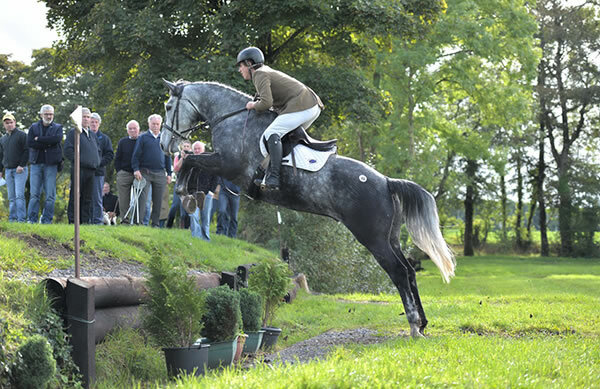 Shows formats can include a variety of disciplines from show jumping, showing classes, in hand and ridden to hunter trials. Shows offer a great day of entertainment and a smart way of viewing stock in a more informal setting where you often meet the rider /breeder. Many horses at these shows will be for sale so it can be a good way of spotting a horse, seeing it in action and making an enquiry or finding out more information. *Note it is recommended at all times that buyers carry out a pre purchase inspection with a vet prior to purchasing. Event Rider Fiona Davidson riding sidesaddle at the opening meet of the Quorn Hunt 2016. Sold at the Show and Go. 7 y.o Golden River out of a Dockleaf Dam.